I stayed at this hotel for 3 nights during the last days of my Australia 2013 trip. I really enjoyed staying this hotel. The Vibe Hotel Sydney is located in Goulburn St, which is part of the CBD. The two nearest city rail stations are Central and Museum. The Central station is about 10 minutes by foot away, Museum station only 5 minutes. he airport link train also stops at these stations. Because the hotel is in the CBD you’ll can find almost anything you need nearby. Mini marts, Bars, restaurants and coffee shops are only few steps or minutes away. The reception staff was very friendly and upgraded me to a “Deluxe Suite Queen and Sofa”, which was really nice. 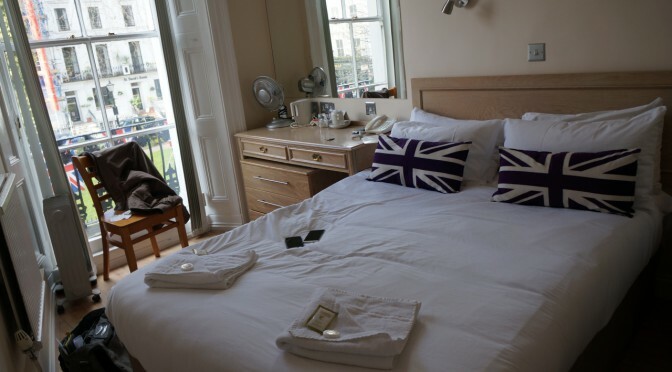 The bedroom features a queen size bed flat screen and an alarm clock. The seperate living room a coach and a desk and a second tv. The bathroom has a bath tub with shower. I believe I stayed at the 7th or 8th floor. The suite has a friendly and warm interior and was clean. It was very quiet thanks to the high floor. WiFi is not included. I didn’t try it, because I had connectivity through my smartphone with integrated WiFi hotspot. Can I recommend this hotel? Yes, it is a great option for your stay in Sydney. Especially the location is a huge plus for exploring the city by public transport or getting to the airport. This review and all the other reviews on this blog are not sponsored. Welcome to my first hotel review in Australia this year. In October 2013, I stayed at the Travelodge Mirambeena Resort Darwin. This resort offers both “motel” and “hotel” accomodation. In this review I focus on the so called “motel room”. There’s also a so called “budget motel room”, which I wont describe in this post. I got a motel room with Queen size bed and a second bed on the first floor (one level above ground floor). The room featured a flatscreen TV, an A/C and a small table. The bathroom was clean and had a shower. There also a small fridge in the room and a in-room safe with digits pad. The hotel/motel offers two swimming pools and a bristro area. 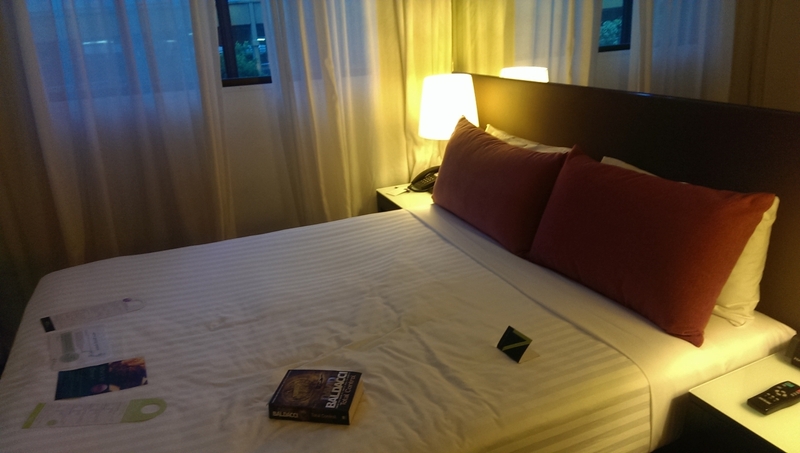 I enjoyed spending some time relaxing at the pool and reading my newest novel, which I bought at the Darwin Bookshop. A fitness room and internet terminals are also on location. The hotel is conviniently located at Cavenagh Street. There’s a Woolworth supermarket located across the street. Want to send a postcard home? There’s also an Australia Post office on Cavenagh Street, just a 5 minutes walk from the hotel. Want to go on a shopping spree? Downtown Darwin is just a 10-15 minutes walk away. There quite a few smaller shops and a few shopping malls. I only tasted the continental breakfast option, which was good. 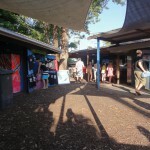 All the standards were on offer: coffee, tea, toast, vegemite, jam, cereals, fruits. Sorry, no photos this time. Check out the photos from the official website, they’re pretty accurate. I stayed at this hotel during my first trip to Singapore. The Peninsula Excelsior is located in Coleman St., right at the city centre. There’s a MRT station “City hall” of the East-West line nearby. (about 5-10 minutes walking). You’ll find a 7/11 store, a few restaurants and a few shopping malls within a few minutes walking. Thanks to the MRT, you’re greatly connected to many attractions and shopping malls. I had a Superior Room during my 3 nights stay at this hotel. 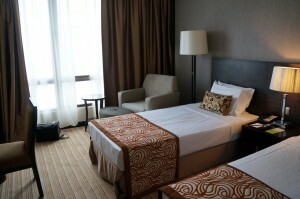 The room features twin beds, a desk, an armchair and a flat screen. The enclosed bathroom has a shower cabin and a huge mirror. Wish: It could be a bit cleaner for Singapore standards . I had some good nights sleep, even though my room was next to the elevator. The main room was clean. I haven’t tried the breakfast. There’s also a pool, a spa and a gym on the higher floors. The staff at the reception desk and the luggage storage was very friendly. Can I recommend this hotel? Yes, it is a good option for a stop over. Lets’s review my first Australian Contiki Tour. 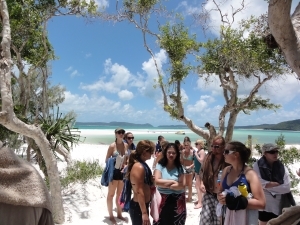 The Beaches and Reefs tour is part of the bigger Aussie Explorer tour in Australia. If you’re interested in doing the Aussie Explorer tour this article maybe right for you, as it features about 60% of the tour you’re going to do. Aussie Explorer is a 2 part tour. The East Cost from Sydney to Cairns and the second part from Alice Springs to Darwin (or reverse). The Beaches and Reefs Tour goes from Sydney to cairns (or reverse). My first Australian Contiki starts in Sydney. Day 2 we drove to Coffs Harbour, stopping in Port Macquarie for lunch. At this place we stayed at a Surf Camp in little containers and had our first surfing class. Our container didn’t have a toilet, therefore we received a voucher worth 150 AUD for photos and a free T-Shirt. Day 3 we headed to Surfers Paradise, stopping in Byron Bay for a few hours for lunch. On our way to Surfers Paradise, we stopped at Cape Byron which is Australia’s most eastern point. Then, we crossed over to Queensland and visited the Currumbin Wildlife Sanctuary where we pet kangaroos and took photos with Koalas. Day 4 was a day for optionals and free time at Surfers Paradise. I spend the morning jumping out of a plane. Sky diving at the Gold Coast with a landing on a beach. It’s just amazing. In the afternoon I spent some time at Billabong and took lots of photos. Then we went out to Sin City with the whole group. Day 5 we stopped at Brisbane, capital of Queensland for a few hours to experience the city. We also saw a presentations about opals. 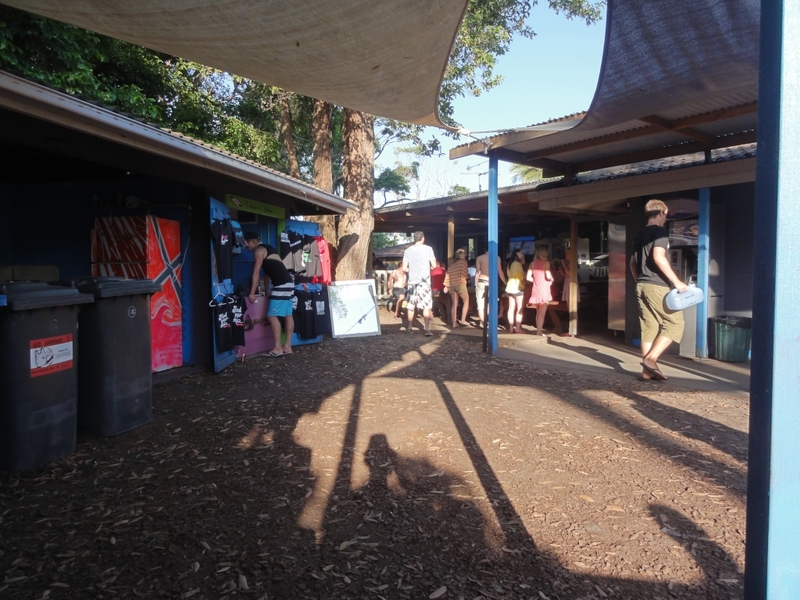 The we drove to Noosa, a trendy beach town. Day 6 most of us booked the optional 4WD Fraser Island Day tour which took us all through the island’s sandunes, rainforests and freshwater lakes. Swimming at McKenzie Lake and a nice BBQ afterwards. Day 7 After a night in bunk beds we headed to a country homestead in the heart of Queensland. Most of us dressed up in our western gear for our big roast dinner and then Karaoke night! 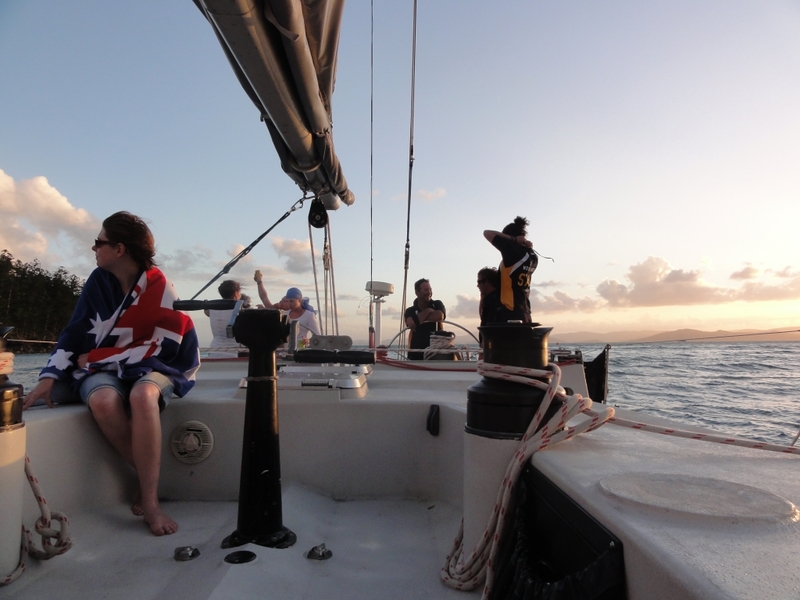 Day 8, 9, 10 involved sailing around the beautiful Whitsunday Islands on a racing sail boat. This was not the relaxing yacht ride that many of us thought we were in for. 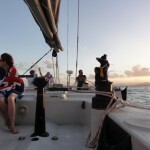 When we were sailing, the boat sat at a 45 degree angle so we would all have to sit at one side of the boat. 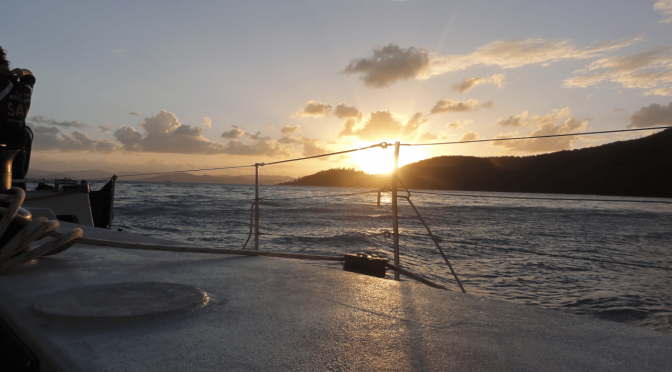 Sailing included us hanging our legs over the edge, taking in the beautiful views of the islands. We also stopped at a few places where we got to snorkel and see lots of amazing fish. 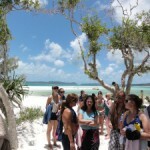 We enjoyed Whitehaven Beach. A few of us even tried sleeping out on the deck under the stars the first night, but it started to rain. The third day in the Whitsundays we stayed at Daydream Island. it’s a big island resort and spa hotel. Day 11 we continued our journey to Cairns, stopping in Townsville on the way for lunch. It was also Australia day. Party time! Day 12 started bright and early. A few of of our group (including me) headed to AJ Hackett for bungee jumping and Minjin Swing. I opted for the Minjin swing. Day 13 the whole group went on an optional Great Barrier Reef cruise where we spent the day snorkelling and scuba diving the most beautiful reef. 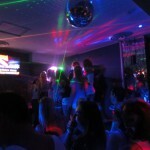 At night, we went out in Cairns to the Woolshed for our last night as a group. Day 14 we made a stop to the rainforest village of Kuranda to see an Aboriginal Experience. We also got to throw a boomerang. Then we made our way back to Cairns Colonial Club Resort. We enjoyed some refreshing Australian beers and said goodbye to some tour mates in our group. This tour is just awesome. 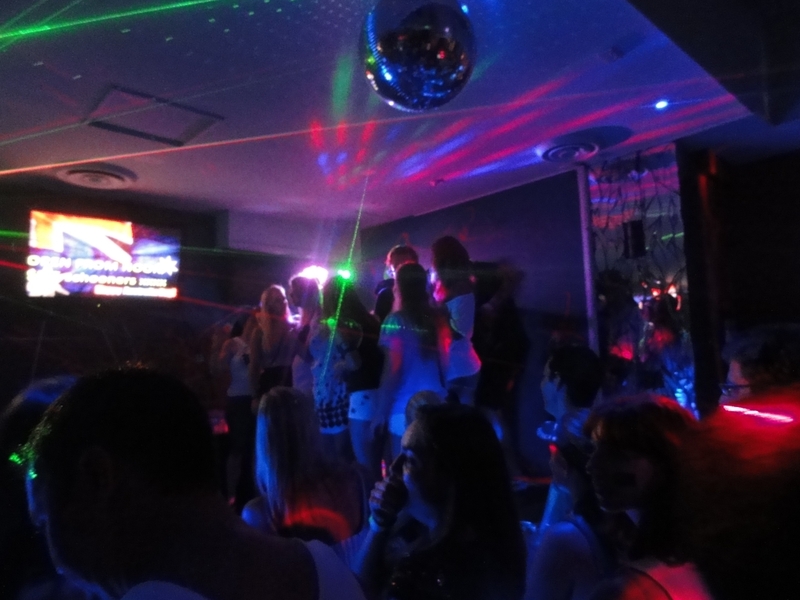 You see so much from the East Coast of Australia and you also have fun at night with night clubs, Karaoke on a farm and a nice sleep under the stars. My personal favourite is sailling between the Whitsundays and going Sky diving at the Gold Coast. You have to do this tour!